Old Big 'Ead has named the substitutes in his Forest Dreamteam. It follows his selection of the best eleven players who served him at the City Ground (see below). The substitutes are: Hans van Breukelen, Larry Lloyd, Ian Bowyer, Martin O'Neill and Nigel Clough. "I couldn't overlook my son for a place on the bench, even if the competition included the likes of Tony Woodcock," said Clough. "He got more stick from me than any other player but came bouncing back and always did his job to the best of his ability." The Master Manager has paid tribute to the football commentator Brian Moore, who died during 2001. Clough and Moore worked together many times over the years and Old Big 'Ead attended his friend's funeral in September. "I would have been heartbroken not to have been there," Clough told a special programme about Moore on the radio station talksport (December 24th, 2001). "He died too soon. He had enough love to last another twenty years." Clough recalled a number of anecdotes about the man who became a family friend. "I was working with him at London Weekend Television and I was having trouble with the autocue. It kept stopping. So Brian said to the studio staff, 'why don't you write it on some idiot boards?' I told him, 'Don't call me an idiot', and we laughed. It broke the ice. I also remember going to see him when I was at Brighton. We'd lost 8-2 at home and they'd taken bets in the studio on whether I would turn up. Only one person bet that I would be there. And it was Brian. He gave me great confidence and was a very genuine man." Old Big 'Ead says it's "garbage" to blame tiredness for Manchester United's recent dip in form. He told The Sun newspaper (December 14th, 2001) he couldn't understand why some of their top players had been rested. "Is it right some of them have complained of tiredness? That Fergie has had to rest them because they were tired? That's garbage. We used to play Saturday-Wednesday-Saturday. I picked the same team - my best team - as often as I could. Don't tell me the Champions League has changed the demands of the game that much." Brian Clough has spoken of his sadness over Nottingham Forest's financial plight. During a radio phone-in (December 13th, 2001), he called on fans to back the club. "If it's true what I hear that they are losing seventy, eighty, possibly £100,000 a week, nobody can survive that. The place will go bankrupt, there will be padlocks on the gates and the turnstiles locked," he said. "It makes me very sad. I think of the eighteen years I spent there and I think most of it has been wasted away somewhere along the line. We built the team to compete with Liverpool and Manchester United. It does sadden me but you have to be an optimist. Nottingham Forest has got to get on the front foot and the city has got to get around them too." The Master Manager also criticised the Forest directors for telling boss Paul Hart not to pick Chris Bart-Williams, after the player turned down two transfers. Clough said the board had put the manager "in an impossible position." He said it was up to the manager to pick his best team and it was dangerous to let directors have a say in the selection. "Once you open the door to them, they want to do everything," he told 106 Century FM. "Let them clean the baths if they want to." Old Big 'Ead says he's not surprised that ITV failed to attract big enough audiences for their Saturday evening football programme. "The timing was daft, because at seven-o-clock you're not back from the post-match inquest in the pub and the good lady of the house wants some escapism like Cilla Black," he says. In the January edition of Four Four Two magazine Clough says half-past-ten is the perfect time to watch football and unwind. He adds: "By moving from the BBC to ITV, Desmond Lynam dropped the biggest clanger since I slagged off that Polish goalkeeper." Clough also has some choice words to describe the Manchester United goalkeeper, Fabian Barthez, who has made a number of errors this season. "Barthez looks at times as if he's had more red wine than even I ever managed to drink - he's far too erratic." The Master Manager has named Trevor Francis and Garry Birtles as the best strikers who played for him at Nottingham Forest. Cloughie was listing his Forest Dreamteam, made up of the top players who served him at the City Ground. He said: "Picking my best team used to come easy to me, but this was different. When you think of all the names who have played for Old Big 'Ead down the years, the list is almost endless." His Dreamteam is: Peter Shilton, Viv Anderson, Stuart Pearce, Des Walker, Kenny Burns, Roy Keane, John McGovern, Archie Gemmill, Garry Birtles, Trevor Francis and John Robertson. Clough added: "It's that good a team my son can't get in it - and he's the second highest scorer in the history of the club. I think he's entitled to ask if there is a place for him on the bench!" A limited edition framed montage of the team, signed by Clough, is available from the photo agency, Empics. Read the special Dreamteam feature. The former Nottingham Forest captain John McGovern has again pledged his support for the campaign to get a knighthood for the Great Man. Interviewed on BBC Radio Five Live (November 27th, 2001) about this website's campaign to get the ultimate accolade for Cloughie, McGovern said: "His record speaks for itself. He stood for everything that is good for the game." When compared with other managers, there was no contest. "The speed with which he achieved success, with less money to back him up, beats everyone else into a cocked hat." Message from the Editor: Thanks for all the e-mails of support following the feature on BBC Radio Five Live. Archive report: The Nottingham Forest manager Paul Hart has given his backing to this website's campaign to get a knighthood for Old Big 'Ead. Hart, who played under Cloughie in the Eighties, said: "I give my full support to the campaign to try and obtain a knighthood for Mr Clough. Good luck with your endeavours." More than one-thousand e-mails of support have now been received. The latest batch has been sent to the Culture Secretary, Tessa Jowell. In reply, government officials in the Honours Unit have said Clough remains under consideration. The Great Man produced another classic quote in a television interview (November, 2001). Talking about his greatest ever Forest team (see the item below), he told Central TV: "I wouldn't say I was the best manager in the business. But I was in the top one." The Master Manager has visited the City Ground again and told the Reds manager Paul Hart that he's "doing a great job." Clough said he had watched Forest play West Bromwich Albion on television and he was impressed with the way the team had "knocked it about." He added: "Nobody believed in a passing game more than me and I'm delighted you're following Old Big 'Ead's philosophies." The Great Man was signing framed copies of his Dreamteam, made up of his all-time favourite Forest side. The team comprises players from throughout his managerial reign at the City Ground. The limited edition framed montage has been compiled by the photo agency Empics. Visit their picture gallery, where you can order Clough photos. Brian Clough has reminded football fans about his great talent for walking on water. He told a radio phone-in that the River Trent next to Nottingham Forest's City Ground had posed no problems for him. His comments on 106 Century FM were connected with a question about how he ensured his players behaved themselves on the pitch, including fining them. He said: "I used to look up at Larry Lloyd and think that one of these days he's going to belt me and I'll finish up in the Trent. But I would have had no trouble in the Trent because I had a path I used to walk across." The Great Man has taken another swipe at the football chairmen who keep sacking their managers. He describes the current spate of managerial casualties as "a barmy situation" and says the chairmen are "a pack of wolves devouring everything in sight." Speaking on a radio phone-in (November 2001) he added: "The chairmen are not making any improvements because all they're doing is sacking the present managers and re-engaging those who've already had the sack from another club." Clough told listeners to 106 Century FM: "There should be a rule that if the manager goes within a year, then the chairman goes with him." There's a full report on his phone-in comments, including his thoughts on Derby, Forest and Sir Alex HERE. Old Big 'Ead says Arsenal's David Seaman should not be picked as England's goalkeeper. In the December edition of Four Four Two magazine, Clough comments: "Seaman should be told with gratitude that his ponytail and slowing reflexes are now exclusively at the disposal of his club." In the same column, the Master Manager praises David Beckham and says he likes to see him sitting in the stand alongside his son. "Daft name, though, Brooklyn. I wonder which of his parents chose that?" It's reported that a book publisher is planning to offer the Master Manager a six-figure sum for a follow-up to his highly successful autobiography. According to the Daily Mail (Nov 2nd, 2001) the second book will be out next October. The wise words of Brian Clough have been remembered by the West Ham manager, Glenn Roeder, who has faced a difficult start to the Premiership season. Reflecting on the number of managers who have already lost their jobs this season, Roeder told the Daily Mail: "I remember the words of Brian Clough once. When asked how he was, he said he was 'surviving'. How ridiculous. He'd won a championship and two European Cups. But that's all we hope for, to survive." The Master Manager has admitted he regrets the comments he made about Liverpool supporters following the Hillsborough Disaster in 1989. In the November edition of Four Four Two magazine he says he wants to "make peace" with the Liverpool fans who have been upset by his remarks. In his autobiography, Clough blamed Liverpool supporters for the tragedy. In a TV interview he said some had been drunk. He now says he realises he was misinformed and adds: "I now accept that I went too far in giving my opinions about Hillsborough." Old Big 'Ead has been named 'Number One' in the list of 'Football's Top Ten Brians'! The September edition of Total Football magazine put Clough at the top of this unusual list, in front of Bryan Robson (second) and Bryan Roy (tenth). The magazine described Clough as "the most truthful and most quotable Brian the game has ever seen." England's World Cup hero Sir Geoff Hurst has backed this website's campaign for the Master Manager to be knighted. Speaking to BBC Radio Nottingham, Sir Geoff said Clough should have been made England manager years ago and that he deserved the honour of a knighthood. He also told the Brian Tansley programme that when he was in the insurance business, he'd tried to sell a policy to Old Big 'Ead. Although Clough gave Sir Geoff half an hour of his time in his office before a match, he was unable to persuade him to sign-up. Brian Clough was one of the mourners at the memorial service for 'the voice of football', Brian Moore. The Master Manager joined other famous names like Harry Carpenter and Dickie Davies at the service in St Giles' Church in Farnborough, Kent (September 10th, 2001). Over the years, Moore interviewed Clough a number of times and presented a special video tracing his life, called 'The Brian Clough Story'. A self-confessed 'cricket nut', Brian Clough watched Nottinghamshire beat Derbyshire at Trent Bridge (August 25th, 2001). He then went into the dressing room as a guest of the manager, Clive Rice, and spoke to the players. Afterwards, in an exclusive interview with BBC Radio Nottingham he said: "Getting into a dressing room is hallowed ground. No-one ever got into mine. So I was very privileged today." The interviewer, John Shaw, asked him about Forest and what he thought about the type of football they were playing under Paul Hart. He responded: "If they keep playing the ball and heading the ball, then that is the name of the game. You have got to caress the football as if it is your best friend." Then, in his inimitable style, he added: "If I stuck that microphone up your shirt, you would be hopeless. It's the same with a football. It's a thing you have to look after. When you get it, play it." The Great Man produced another piece of wonderful wit while appearing on a radio phone-in on the eve of the Premiership season. Asked about Derby's new signing, Fabrizio Ravenelli, the Master Manager replied: "The nearest I've got to Ravenelli is in the Co-op. They sell it in tins." Speaking on 106 Century FM, Clough also described David Ginola as "an exceptionally talented young man" and said he had watched England's defeat by Holland on television at home. "I was so disappointed, I kicked the cat twice - which is two more kicks than England got." Brian Clough has recalled how he substituted Martin O'Neill in a Charity Shield match because he was greedy with the ball. Clough's Forest beat Ipswich 5-0 in the 1978 curtain raiser. O'Neill had scored twice and was looking for his hat-trick. "He was no longer playing for the team," says Clough in the September edition of Four Four Two magazine. Clough told his trainer Jimmy Gordon: "He's coming off, or we play with two balls - one so he can carry on showing off, and the other for the rest of the team." It's something both Clough and O'Neill have since talked about. "Twenty years later, when we met up for lunch, he told me he'd never forgotten the lesson he'd learnt from me that day." There are more great comments in this excellent column. The Master Manager paid a visit to the City Ground to watch Nottingham Forest's first match of the new season (August 11th, 2001). Forest, now managed by Clough's former defender Paul Hart, conceded a late equaliser against Sheffield United. Said Clough: "I came to this game to support Paul because I've got faith in him. "Paul is someone I always liked, as a player and as a person, and I firmly believe he possesses the right football instincts to do Forest good. Afterwards, Hart told the media: "It was nice to see Brian Clough here watching. He has always gone on at me about the importance of clean sheets. So you can bet I will get a phone call on Monday morning." Old Big 'Ead has had another dig at the former Middlesbrough manager, Bryan Robson. Clough says Robson was "put out of his misery" when Steve McClaren replaced him, despite having had all the ingredients to be a top manager. He claims that Robson's negative attitude was one of the main reasons behind the club's problems. In his regular column for Four Four Two magazine, Clough says: "It seems to me that Robson's general demeanor let him down...he went out with an air of doom and gloom every match day." Clough also talks about Sir Alex Ferguson and Sol Campbell in the magazine's August edition. The Master Manager has attended the funeral of a senior BBC journalist. Paul McCrae had worked with Clough a number of times over the years. He was recently responsible for the outstanding documentary looking at Nigel's career at Burton Albion. The funeral service was held in Derby. Old Big 'Ead has taken a swipe at 'player power' and described how English football currently "fills me with despair." He says Arsenal's Patrick Vierra is wrong to criticise his manager's signings and question the club's status, while looking to leave in order to win medals. Clough told The Sun newspaper that a player's ambition should start with winning a game. "I gave my players a version of the same message at ten-to-three every Saturday: 'I would shoot my granny right now for three points this afternoon.' They knew how important it was to give everything in the cause of victory. Every time. That's why my granny enjoyed more lives than my cat." Top striker Teddy Sheringham has been describing what it's like to play for the Master Manager. Interviewed in the magazine Four Four Two, he describes Clough as "a real character". He also mentions Old Big 'Ead's preferred name for him at Forest. "When I first went there and met him, he called me 'Edward'. I thought, 'Oh no, he can't call me that.' So I told him I preferred to be called Teddy and he said something like, 'Right you are, Edward.'" Old Big 'Ead has become the new columnist for Four Four Two magazine. In the July edition he talks about Roy Keane, Teddy Sheringham and managers who get the sack. Referring to "Edward" Sheringham, he says: "He was the slowest player in my first team squad - perhaps due to all those nightclubs he kept telling me he didn't frequent. But once we found him space on the park and some good passers of the ball, he scored twenty goals in his only season with me." Clough also spoke about his player of the season, Roy Keane. The will of the fans has been ignored once again by the government and the Honours Commission. Despite countless messages in support of a knighthood for the Great Man, the powers-that-be have shown how out of touch they are by omitting him from the Birthday Honours List (June 16th, 2001). Old Big 'Ead has finished in the top three of an on-line poll to elect Nottinghamshire's first 'virtual' MP. Clough attracted twenty-six per-cent of the votes, narrowly behind Robin Hood and actress Su Pollard. The poll was organised by the BBC's Nottingham website, as part of their Election 2001 coverage. The Master Manager launched a scathing attack on David Beckham's decision to sport a Mohican haircut as he captained England in a friendly against Mexico. Clough, whose teams were renowned for self-discipline and their clean-cut image, said Beckham looked like a convict. He told The Sun (May 25th, 2001) that an England captain should not have such a "grotesque" haircut. He fumed: "That is not a hairstyle he has had done. It is a mess. Worse than that, far worse, it is a downright insult to one of the most prestigious posts in sport." Clough said it sent the wrong message to youngsters, for whom Beckham was a role-model. "I would have told him he was no longer captain until he had grown his hair," said Clough. Beckham said later that he was "upset" by Clough's comments. Old Big 'Ead was the guest of honour at a special dinner to remember England hero Sir Stanley Matthews, who was known as the Wizard of Dribble. The Master Manager delivered a witty and poignant speech at the event held at Stoke City's Britannia Stadium on May 19th, 2001. Read the special report HERE. Exclusive pictures HERE. Brian's son, Nigel, has given his backing to the idea of a testimonial match for the Master Manager at the City Ground. Speaking on 106 Century FM (May 15th, 2001), he said it would be a fitting tribute. "We've just had the twenty-fifth anniversary of him joining Forest and a quarter of a century is a long time," he said. Asked whether his father would like the idea, he replied: "I think he'd be pleased and probably a little embarrassed that it's eight years since he retired and they're still talking about it." Brian Clough is expected to be the guest of honour at a special event in memory of England hero Sir Stanley Matthews. Old Big 'Ead is due to appear at a Legends Dinner organised by the Sir Stanley Matthews Foundation on Saturday May 19th, 2001, at Stoke City's Britannia Stadium. The proceeds of ticket sales for the event will go to the foundation. The Master Manager has described the agony of facing relegation and feeling powerless to avoid it. In an end-of-season interview with BBC Radio, Clough said he could understand the frustrations many managers, including himself, had to face to avoid the drop. "Fear of relegation can dominate your life. In my case at Forest, it consumed me completely. I knew I was playing well but couldn't win a match." He said that towards the end of his final season with the Reds it eroded his confidence to such an extent he questioned whether he could still manage. And with a smile he said: "I'd been short of confidence throughout my life." He also said it was a shame that Jim Smith had decided not to join him in retirement to play "crib and dominoes." Former Forest defender Brian Laws has revealed how he saved Cloughie's blushes at Wembley. The team was about to leave the dressing room before a Littlewoods Cup Final when the Master Manager, dressed in a suit, asked Laws how he looked. "He looked uncomfortable in his suit because he preferred his famous green jersey, which he was going to change into later," said Laws "I told him: 'Gaffer, you look fantastic. The suit looks great, but I don't think the slippers will go down very well'." Realising he was still wearing his carpet slippers, Clough replied: "Thanks Lawsie, you've saved my bacon." Laws recounted the anecdote on Brian Tansley's Matchday Programme on BBC Radio Nottingham (May 5th, 2001). Brian Clough's continued popularity is reflected in the milestone reached by this website, which has now clocked-up more than 10,000 hits since its launch in August, 2000. The five figure hit count was recorded on May 2nd, 2001, representing more than one thousand hits a month. The site has been visited by fans of the great man from all over the world, with hundreds of e-mails demonstrating their affection and admiration for the Master Manager. Old Big 'Ead has received a special award from the listeners of a local radio station. 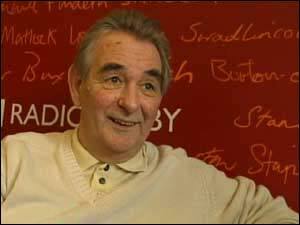 Clough was voted the most influential person of the last thirty years in Derbyshire, in a poll by BBC Radio Derby. During a visit to the station (April 27, 2001), the former Rams boss spoke to phone-in callers and was presented with a crystal rose bowl. "It's absolutely beautiful," he said. "I'm partial to tangerines and I'll get a dozen satsumas in this vase." Looking at the presentation box, he said: "Have you put it through the bomb squad? I'm not that popular, you know." He later said it was "a miracle" to have won the vote. He also told one caller he had given his football medals to his grandson, adding:. "He can now retire overnight at the age of twelve." The outspoken Master Manager has described Manchester United's Roy Keane as a cross between Dracula and Al Capone, following his shocking challenge on Manchester City's Alfie Haaland. In an excellent interview in The Sun (April 27, 2001), Clough warned Sir Alex Ferguson: "If Manchester United's manager does not sort out that lad once and for all, he runs the risk of losing his own credibility." Clough said he was staggered to hear that Sir Alex hadn't seen the incident. "I can believe Lennox Lewis didn't see that punch coming last Sunday morning and the skipper of the Titanic had some excuse for not spotting an iceberg if it was dark. But I couldn't believe my big ears when Fergie said he hadn't seen the tackle..."
Although Old Big 'Ead respects his former player's ability, he said the challenge was one of the worst fouls he had ever seen. "As if cutting Haaland in half wasn't bad enough, Keane then swoops over him like Dracula. All he needed was the black cloak." Clough said that eight red cards and a spell out injured had given Keane plenty of time off. "He has had more than enough rest through suspensions alone. He has had more holidays than Judith Chalmers." The Master Manager was the subject of an hour-long documentary on Channel Four, simply called 'Old Big 'Ead' (April 26, 2001). It featured fascinating footage and interviews about his career, including an exclusive interview with the great man himself. Guests included Martin O'Neill, John McGovern, Garry Birtles, John O'Hare and The Sun's John Sadler. There was even a vintage clip of boxer Mohammed Ali saying: "There's a fella named Brian Clough...some soccer player or something. I heard this fella talks too much. Whoever you are, I am the talker. Now, Clough, I've had enough. Stop it!" The outstanding programme took viewers on the rollercoaster ride of Cloughie's career, highlighting his superb motivational skills. Alan Hill, who worked alongside the Master Manager at Forest, revealed how Clough began singing 'Fly Me To The Moon' in a dressing room full of players shortly before a match. He said Clough then told them: "I'm a good singer, aren't I lads? And you're good players. That's why you play for me." Close friend Ron Fenton, who was part of the backroom staff at the City Ground, said he believed Clough would have retired in 1991 if he had won the FA Cup, because his health was not good. Fenton said that at the time, "Brian obviously drank too much and that affected his health. There is no doubt about that." Fenton added that Clough was now much better. "I hope he starts enjoying his life again." To demonstrate that Clough, who says he no longer drinks, is still on top form, the programme ended with some great quotes: "I would have problems with the foreign players these days because they wouldn't be able to understand me and I certainly can't speak half of their languages. But there is one word they all understand...*!? * off! They understand that!" A Clough fan who studied his management style as part of a university degree has praised Old Big 'Ead on BBC Radio. Neale Callender, a Forest fan from Ilkeston in Derbyshire, was interviewed on Radio Nottingham as part of coverage of the knighthood campaign. "Busby and Ferguson achieved league and European success, but Brian did it with a small club. So his was a much greater feat. It should be Sir Brian," said Neale, whose study can be read at the Institute of Football Studies in Preston. ARCHIVE REPORT: Government officials have insisted that the Master Manager is still in the reckoning for a knighthood, following the campaign by this website. More e-mails of support have been sent to the Prime Minister and honours officials. In response, the Honours Secretary Diane Macfarlane has written to the website editor to say: "Mr Clough's contribution has not been overlooked. He remains under consideration for future honours rounds." It is hoped Old Big 'Ead will be included in the Queen's Birthday Honours list in June. Derby County manager Jim Smith has also written in support of the campaign. The Master Manager has received a Lifetime Achievement Award at a special ceremony. Old Big 'Ead collected the honour from Derby County manager Jim Smith at the Century Football Awards held at Pride Park Stadium (April 22, 2001). Clough concluded a witty, sharp-tongued acceptance speech by saying: "When you get to know me, what you see is what you get, and it's not bad. Don't forget I love you." Among the invited audience were Sir Geoff Hurst, Ron Atkinson, David Platt and players from Derby County, Nottingham Forest and Leicester City. Clough arrived at the event with his wife Barbara and walked up a red carpet before signing autographs for fans who had been waiting outside in the rain. The Great Man insisted on allowing them inside the foyer so he could sign their books and photographs. Exclusive Photos. The Great Man has heaped praise on his former Forest star Martin O'Neill. In an exclusive interview with BBC Nottingham, Old Big 'Ead said O'Neill was doing a tremendous job as manager of Celtic, who have been crowned Scottish champions. And with typical humour, Clough added: "After non-league management, he finished-up at Leicester. Anybody who can do anything in Leicester but make a jumper has got to be a genius." The Master Manager says his footballer of the year is Roy Keane. He describes the Manchester United star as "a great all-rounder with a terrific level of consistency." Clough says Keane has "grown-up a lot since he was a talented but angry young man playing for me" and adds that being married and having a family seems to have calmed him down. In the May edition of BBC Match of the Day magazine The Great Man says Keane "sets an incredibly high standard as a driving force in midfield." A former Forest player has revealed how he was substituted by Old Big 'Ead even before a match got underway. Larry Lloyd said it happened on a pre-season tour of America and Canada. "We were lining up for the national anthems and I had my socks down," said Lloyd. The referee asked him to pull them up and the big man refused. "I saw the referee go off towards the bench and a few minutes later I looked over and saw the board held up with my number on it." Remembering the incident on Brian Tansley's Matchday Programme on BBC Radio Nottingham, Lloyd added: "I must be one of the very few people to be substituted before kick-off." The Great Man has hinted he would like a testimonial match at the City Ground. He told a radio phone-in that he hoped the directors at Nottingham Forest were listening. "I'm getting bits and bobs of awards now which I never got as a player. I hope the same thing happens with the testimonial. I hope the directors at Forest get the message." He told 106 Century FM (March 28, 2001) that if the club wanted him to return to watch matches, all they had to do was ask. He also revealed that when Martin O'Neill left Leicester City, the Foxes had inquired whether he would come out of retirement. "I've had the odd twinge where I've wanted to get back into the game," he said. "When Martin was going, Leicester made a couple of verbal inquiries." Clough also had a swipe at Notts County. He said his son Nigel had been to see the Magpies' reserves as part of his managerial work at Burton Albion. "Anyone who goes to see Notts County reserves has got to be wanting to learn his trade. I'm telling you, I wouldn't cross the road to watch Notts County, never mind the reserves." Old Big 'Ead has been speaking again about the knighthood campaign, which was launched by this website. Asked on a radio phone-in whether he would like the honour, he replied: "It would be tremendous. But I don't decide things like that. I decide where our Queen lives and how much money we give her and mundane things like that. But I don't decide knighthoods." More knighthood news HERE. Speaking on 106 Century FM, he also had a joke at Sir Alex Ferguson's expense. The Master Manager remembered having a drink with Sir Alex before a match. "He took me into his office and gave me a drop of sherry. I told him I didn't think they were still making thimbles." Competition winner Mick Tucker has been presented with the special Clough coin he won on this website. Mick, from Cramlington in Northumberland, received the bronze coin in a presentation box at a special event at the Longdale Craft Centre in Ravenshead, Nottinghamshire (March 24th, 2001). It was presented by the sculptor Gordon Brown, who made the famous bronze bust of Cloughie at the City Ground and designed the coin. "It was a fantastic day. I will treasure the coin," said Mick. The Great Man has celebrated his 66th birthday (March 21st, 2001). To mark the day, a radio phone-in encouraged listeners to describe their favourite memories of Clough as a manager. One caller to 106 Century FM in the East Midlands said he met Old Big 'Ead after his last match at the City Ground. The caller said he and his two young daughters had waited to meet him and were taken to his office. "The office was bare except for a record player. Brian put a Frank Sinatra record on and talked to the girls as if they were his own. He adored them." Fans also sent birthday messages to this website. One came from ten year old James Hudson, who said he had just completed his school project about the Master Manager. A newspaper has traced a football fan who was confronted by Old Big 'Ead after running onto the City Ground pitch twelve years ago. Sean O'Hara, now 32, of Bestwood Park, Nottingham, was one of several fans infamously 'clipped round the ear' by Cloughie after a Littlewoods Cup victory. Sean told the Nottingham Evening Post (March 2001) he had been offered thousands of pounds to tell his story at the time. "The media frenzy following the incident was amazing," said Sean. His mother, Jennifer, said Robert Maxwell phoned their house and offered Sean "whatever he wanted" to give his story. Sean refused to make money out of the incident. "People think I profited from it but I did not want to." A few days afterwards, Sean met Cloughie at the City Ground to apologise. He and another fan gave the Great Man a kiss for the cameras. The Master Manager has been speaking about his son Nigel's success at non-league Burton Albion. Clough Senior watches the Brewers play at Eton Park, where Nigel is the manager. Brian told a BBC regional TV programme: "I watch it as a manager and keep my mouth shut. Things have gone well. He's worked hard, actually. I'm quite pleased it's going well." Read more about the programme HERE. Clough fans can now vote for their favourite quote by the outspoken Master Manager. An on-line poll has been launched by this website. Voters can choose from the list of classic quotes on the site or suggest their own. For more details, visit Vote For A Quote. Old Big 'Ead has made the headlines with comments about Bryan Robson's role at Middlesbrough. With the headline, "you're lucky to be in a job young man," one daily paper quotes Clough as saying he has never known a manager get the kind of support that Robson has enjoyed from chairman Steve Gibson. The comments originate from the April edition of BBC Match of the Day magazine. "When you think of all the good men of football who are out of the game, Robson is incredibly lucky still to be in work," says Clough. He says Robson must learn from Terry Venables. But the Master Manager doubts whether Venables will leave 'Boro at the end of the season. "Terry can behave a little bit like one of those fickle women - when he says no, it's a definite maybe. Probably." The two winners of the first brianclough.com competition were linked-up on live radio to praise the Great Man. Frank Swain in Alberta, Canada, and Mick Tucker from Northumberland in the UK were interviewed by Alan Clifford on BBC Radio Nottingham. Frank, who's originally from Nottingham, said he emigrated in 1977. "It was very bad timing," he admitted. "It was a shame to miss-out on the glory years with Brian Clough, but it was nice to see the club get some success." Mick was born just two miles from Clough's birthplace in Middlesbrough. He said: "As a player and manager, there's no-one to touch him. If Alex Ferguson can get a knighthood, I don't see why Brian can't. He's a far better manager." Former Forest favourite Steve Hodge has paid a glowing tribute to the Master Manager. He described Clough as a fantastic manager whose achievements will never be repeated. "The words genius and great are used far too often in football," said Hodge. "There are few great, great managers, but he was one of the best and he should definitely be a Sir." Hodge was speaking at a Forest Legends evening at the City Ground, organised by BBC Radio Nottingham and the Forest supporters club. Read a full report of Hodge's tribute HERE. Old Big 'Ead says he's sympathetic towards under-pressure Premiership managers who have to appear in front of the TV cameras when their sides keep losing. "When I was winning a pot or two, I could please myself when I gave an interview," says Clough. He says he'd usually tell the TV people to clear off because a manager speaks no sense immediately after a match. "Now, I'd have some pipsqueak with a clipboard telling me the cameras were ready for me - thank God, I'm out of it!" Clough tells the March issue of BBC Match of the Day magazine that Coventry boss Gordon Strachan should "calm down", "take no notice of the TV boys", trust his own judgement and keep playing golf with his chairman. "That might be the shrewdest move of all," he adds. Former Forest and Derby keeper Steve Sutton has revealed how he received a surprise telephone call from the Master Manager, asking him to play for Forest. Sutton, a youngster at the time, said he got the call one Sunday night, with the simple message: "Bring your boots and gloves." Sutton turned up for the suggested game, which was Kevin Hector's testimonial match. Clough later signed the promising young keeper after chatting with his father. "He came and had a meal at the local pub," said Sutton. And in the famous Clough-style, Old Big 'Ead said: "Now son, you go and play outside and I will talk to your Dad." When Sutton returned, the contract was signed. Sutton recounted the story on Brian Tansley's Matchday Programme on BBC Radio Nottingham. He also gave his support to the knighthood campaign. "I think he has done as much for the game as any of the other knights," said Sutton. "Sir Alex has done it with all the resources he has. Brian Clough did it on a shoestring. Certainly, there is only one patron saint." Old Big 'Ead has delivered another classic quote. Talking about Posh Spice and the number of shoes she had in her lost luggage during a trip to America, the Master Manager quipped: "Who the hell wants fourteen pairs of shoes when you go on holiday? I haven't had fourteen pairs in my life." Cloughie was speaking on a radio phone-in, where he also talked for the first time about the nomination for a knighthood. "I knew nothing about it," he said. He joked about who was responsible for putting his name forward. "I think it was my next door neighbour and she felt that if I got something like that, I'd have to move." For a full report on his star appearance on 106 Century FM, tune-in to this page. The Master Manager has some timely advice for David Beckham. Cloughie warns that the England star is at a "personal crossroads" where his talent and professionalism may collide with his glamorous lifestyle. The answer, he says, is for Beckham to sign a new contract and for his wife, Victoria, to have more children. "He's a very fit lad now, but if he stops doing his stuff on match day, all that magazine and TV documentary trivia will rebound on him," Old Big 'Ead tells the February edition of BBC Match of the Day magazine. "He should sign a new, long contract with United, persuade his missus to have a few more bairns and get as much rest as he can. And while he's at it, he should guide Posh in the direction of a singing coach, because she's nowhere near as good at her job as her husband." The knighthood campaign is being stepped-up following the intervention of the Nottinghamshire MP and keen Forest fan, Kenneth Clarke. He has backed this website's efforts and has now received a personal letter from the Secretary of State for Culture, Media and Sport, Chris Smith. The campaign for a knighthood will continue, despite the name of the Master Manager failing to appear in the New Year's Honours List. Cloughie's former England colleague Jimmy Greaves says he can't understand why Old Big 'Ead has been overlooked. In his excellent weekly column in The Sun newspaper, Greavsie says the OBE Clough has already received puts him in the same league as Carol Vorderman and Jeremy Beadle. Nevertheless, the campaign will gather pace, with more big-name support to be announced soon. The Master Manager has revealed he's disappointed the England manager's job hasn't gone to an Englishman. However, commenting for the first time on the appointment of Sven Goran Eriksson, Clough says he hopes the Swede will restore pride in the national side, "then we'll all conveniently forget that he isn't one of us." In the January edition of BBC Match of the Day magazine, Clough also quips: "At last we have appointed a manager who speaks English better than the players."